Marc Dupont takes 20 minutes to put on his game-face. It’s thick black paint that the night would envy. When complete, the soft-spoken government worker looks like a menacing warrior ready to terrorize. Along with the paint, Dupont wears a gladiator outfit that cost $1,200 on eBay, carries a plastic sword and sometimes a giant flag with the emblem of his team, the Ottawa Senators. 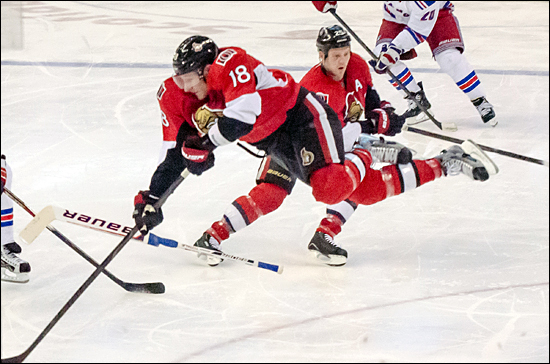 The Sens’ gladiators have become one of the attractions at the NHL rink that seats 19,153. Along with the kid-friendly mascot, Spartacat, the gladiators pump up a crowd that is regarded as too quiet. When theToronto Maple Leafs and Montreal Canadiens play road games in Ottawa, it’s routine to hear fans of the visiting side drown out the home team’s supporters. This year, the Senators asked season-ticket holders to refrain from selling their seats to fans of rival teams, particularly the Leafs and Canadiens. The request was met with snickers from observers around the league, several of whom said the team should focus on getting more out of its own fans rather than thwarting efforts of others trying to reach the rink.